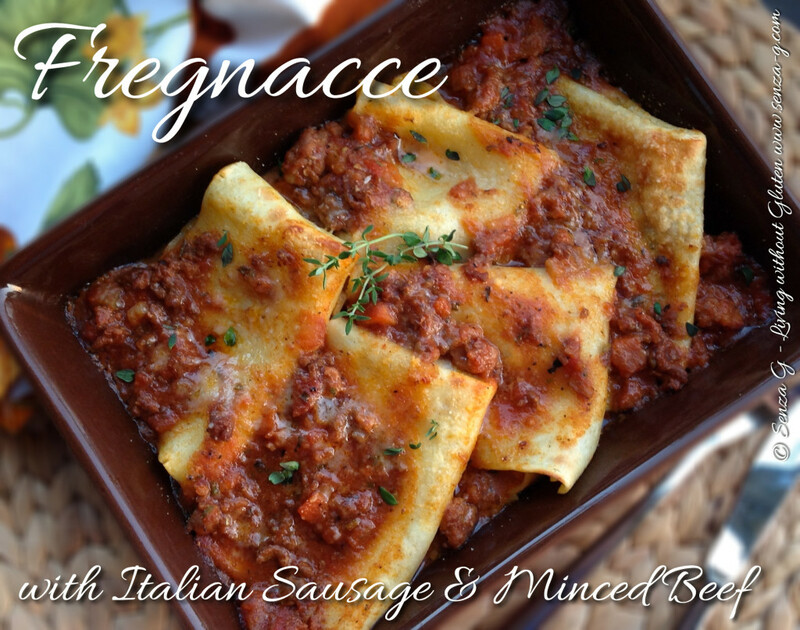 Fregnacce also known as Frescacce, Paciocche and Pantacce, come from Abruzzo. They consist of fresh pasta which come in a square or lozenge shape and are served with a piquant sauce made with various meats or even vegetables and then dusted with Pecorino cheese. I was amazed at how good these came out! They make a welcome change from the usual lasagne! Certainly a recipe to make over and over again! I have slightly adapted the Pasta recipe which NUTRI FREE provides on their package. Start by preparing the fresh pasta. Put the flours in a bowl together with the salt and nutmeg and combine. Add the eggs and mix with the flours until a dough forms. If too dry, add a little water. Knead the dough till smooth. Place in cling film and leave to rest for about 30 minutes. In the meantime, prepare the sauce by sautéing the onion, celery, carrot and garlic in a little oil until soft. Add the minced beef and sausage mince and brown. Pour in the wine, followed by the tomato paste, sugar, tomato pulp, beef stock, herbs, and chilli. Bring to a boil and then lower the heat to a simmer. Season with salt and freshly ground pepper. Leave to simmer for about 30 minutes. Turn off the heat and leave to cool. When cool, divide the sauce into two bowls. Add the beaten egg and the Pecorino to one of the bowls. Prepare individual oven proof dishes by lightly drizzling the bottom with olive oil. Set aside. Cut off pieces from the dough and roll out as thin as possible. You can also use a pasta machine. Cut the dough into squares approximately 5 to 6 inches large. Bring some salted water to boil in a large pot. Throw in the pasta squares, three at a time. Boil until nearly al dente. Drain and place on a board. Place tablespoons of the Mince and Pecorino filling, and fold the square into four, enclosing the filling. Place in one of the oven proof dishes. Do not worry if some filling slips out. You can always refill once it is in the dish. Do the same with the rest of the dough squares, boil, drain, fill, fold and place in the dishes. When the squares are used up, pour the remaining sauce in the other bowl over the Fregnacce. Cover the dishes with foil and place in the oven for approximately 15 mins. Uncover, sprinkle with more Pecorino and turn the oven to grill, until they start to turn just a little golden. Leave to cool slightly and serve.